Little Barn, as its name suggests, was once used for agricultural purposes. Internally no trace of that usage remains! 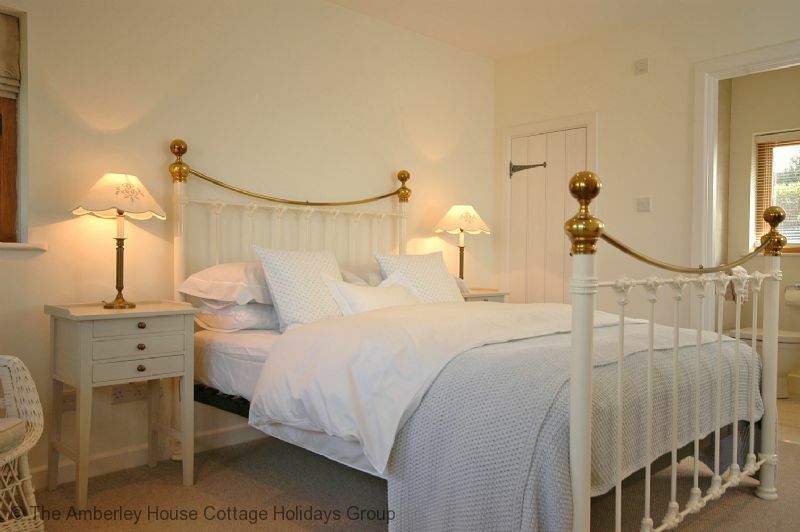 It has been skillfully converted into a charming holiday cottage offering every modern comfort. The quality of the conversion of the barn is so good that it has been nominated for an award by the local authority’s planning department. As well as under floor heating to provide comfort in the colder months it has large windows opening onto the extensive timber decking outside. 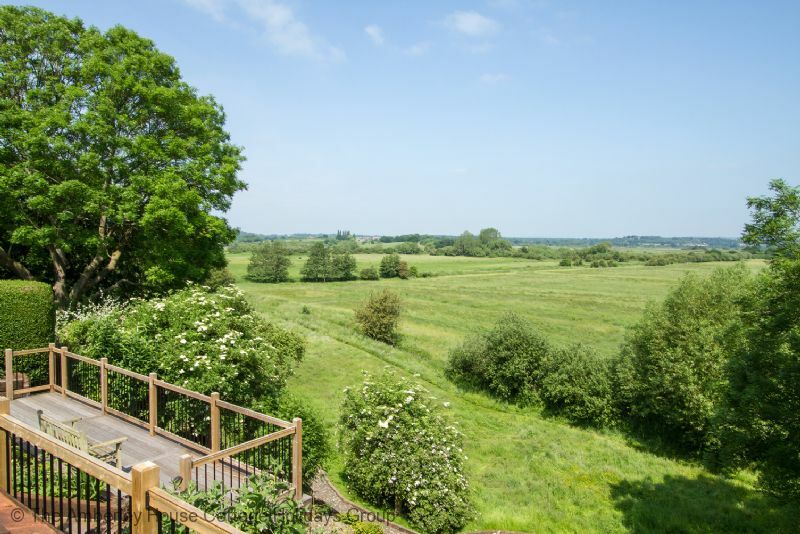 This is one of the highlights of Little Barn, providing guests with uninterrupted views over the Amberley Wildbrooks to the north, and what a view. 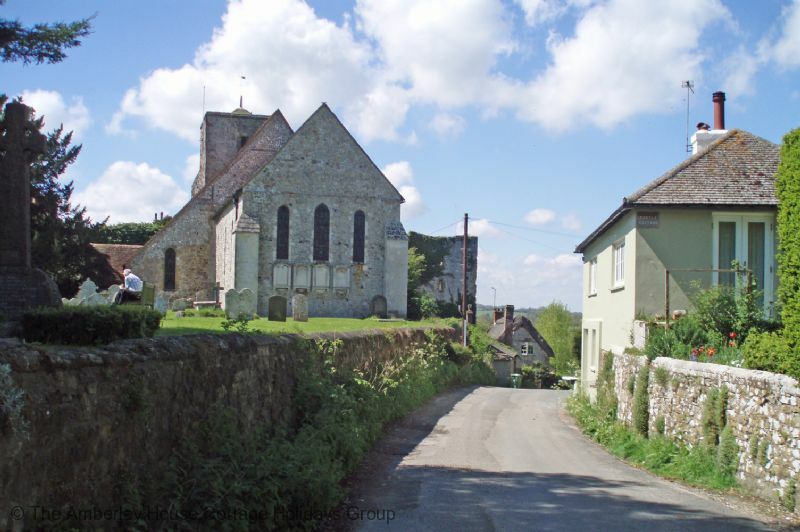 Very few houses in Amberley, let alone anywhere else, have such a breath taking outlook on the doorstep. As you enter Little Barn there is a spacious hall with ample space for shoes and coats. From there you enter the vaulted kitchen/dining room which has a lovely feeling of space and light. The kitchen is fully equipped to allow you to make the most of your stay if you decide to cook, although with the local pub within walking distance you may choose to eat out every night. At the opposite end of the room there is a table and chairs for dining, although if the weather is fine you will want to eat outside on the decking and enjoy the fabulous views. 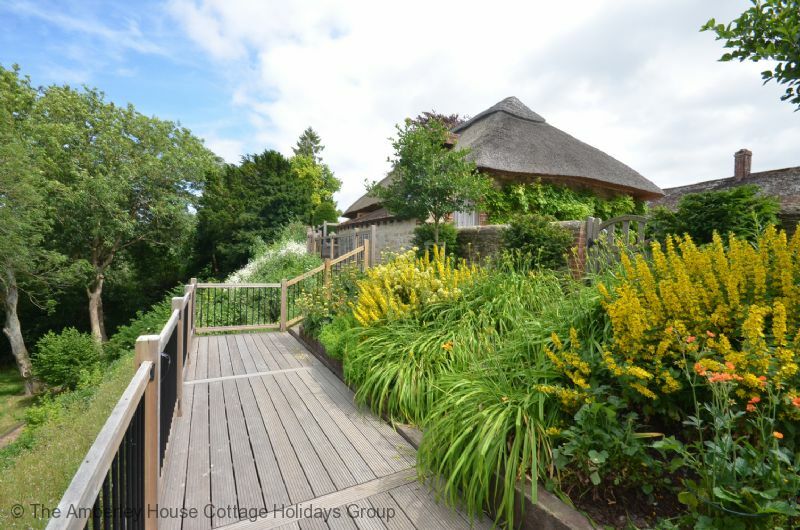 The decking extends to a second level leading to steps that take you to the lower gardens..
A single step from the central dining area leads to the bedroom with king sized ‘And So to Bed’ period style bed, and adjacent shower room with large shower cubicle, basin and WC. 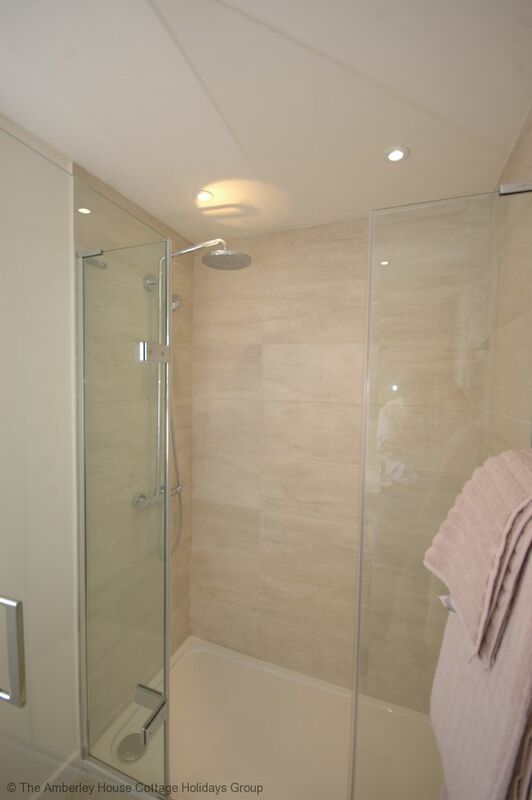 A heated towel rail adds to the comfort and ensures warm towels at any time of the year. Stairs lead from the dining area up to the mezzanine sitting room. Up here you get a close up view of the amazing old timbers making up part of the roof structure of Little Barn. Some of the beams are quite low and others are at floor level, also the ceiling slopes so some care needs to be taken. There are two large arm chairs and a separate area with two sofas and the TV, and the whole mezzanine has immense character due to the timber work and the sloping ceiling, just mind your head when you stand up and move around! 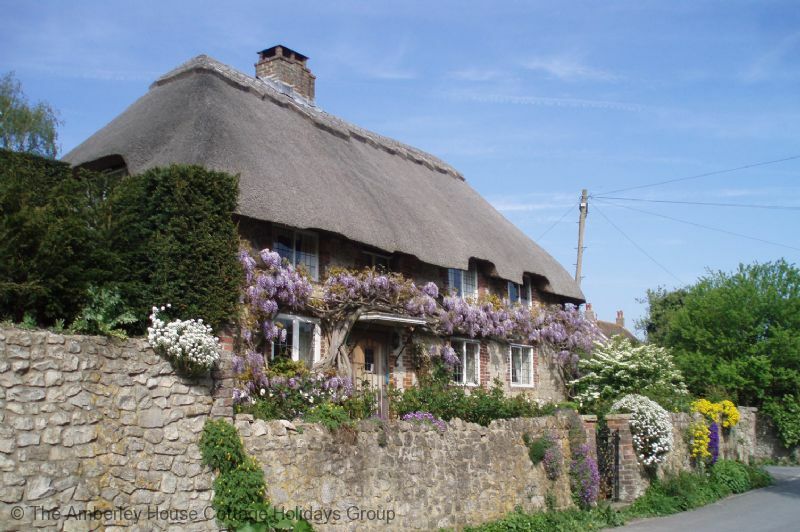 Amberley is at the foot of the South Downs and is noted for its many thatched cottages. It is a village that has managed to retain its character and appeal over the centuries and it will delight. The River Arun with its tidal plain cuts through the South Downs at Amberley. The South Downs Way crosses the river beside the village where a walk either east or west will soon present you with stunning Downland views and total seclusion. The tidal river plain north of the village forms the Amberley Wildbrooks — a Site of Special Scientific Interest known for its wildfowl and maintained by Sussex Wildlife Trust. The RSPB reserve at Pulborough Brooks neighbours Amberley, and is a wetland haven for bird life, and an overwintering ground for many migrant species. It has many opportunities for studying the wild life from several strategically located hides. Only a mile away is the Amberley Working Museum which was used as a set location for the James Bond Film ‘A View to a Kill‘. It is a 36 acre open air museum set into a chalk quarry and is dedicated to the industrial heritage of South East England. 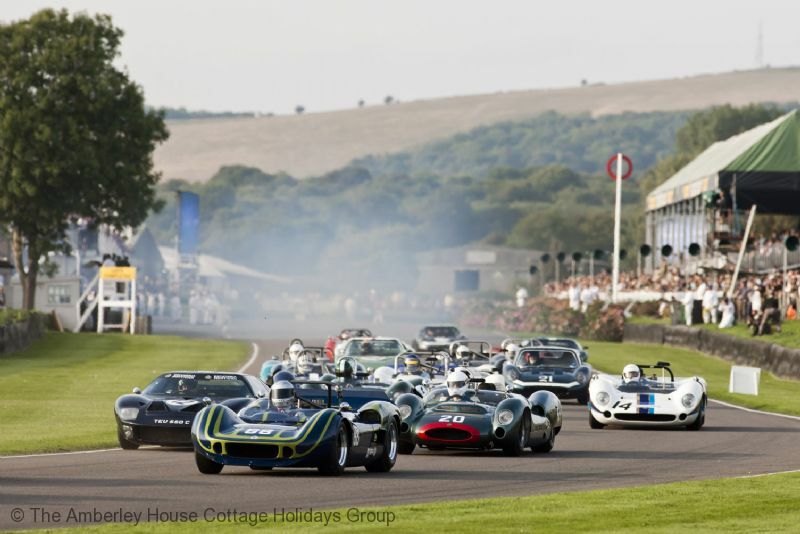 Depending on the timing of your visit there are many themed events so it is worth taking a look to see what is on. Two miles to the east Parham House and Gardens is an imposing Elizabethan house facing the Downs. The rooms are graced with fresh flowers cut daily from the four acre walled garden. The main rooms are the Great Hall, Great Chamber and the Long Gallery which at the top of the house does leave a tremendous visual impression. Five miles downstream from Amberley immediately south of the Downs you come to Arundel, a historic market town dominated by the symbolic castle and the rising spire of the cathedral. If you fancy making your visit a little different why not catch the train one stop down the line and come back on the river, but do allow plenty of time. The town offers a plethora of craft and antique shops as well as restaurants and tearooms. 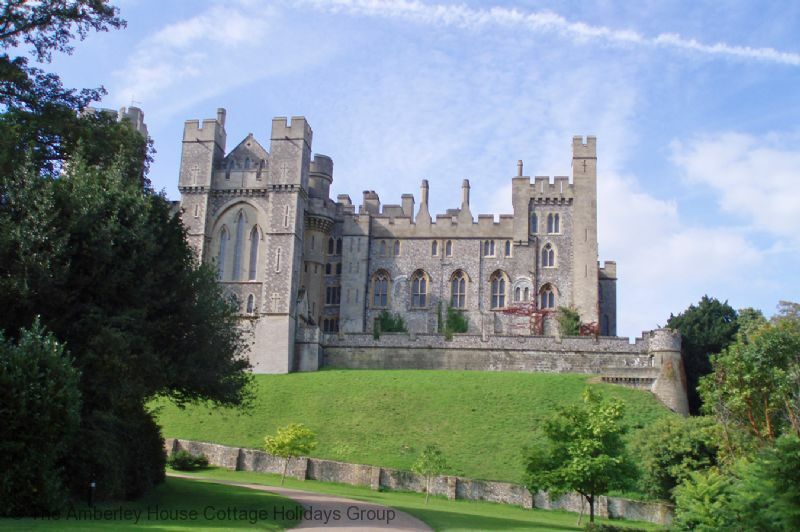 A trip to Arundel would never be complete without visiting the castle. The seat of the Dukes of Norfolk and set in 40 acres of sweeping grounds and gardens, Arundel Castle has been seasonally open to visitors for nearly 200 years. It is one of the great treasure houses of England and to climb the 131 steps to the Keep to take in the views is worth the effort. Little Barn - 198953 Little Barn. There is a top end finish to this holiday rental that is very spacious with outstanding views from the deck over the Amberley Wildbrooks. A downland walkers paradise. Everything we hoped for...and more. 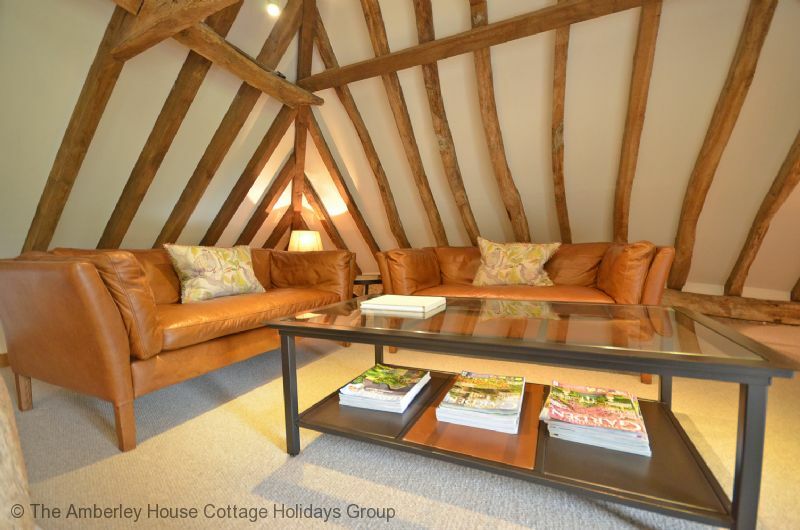 "Our autumn escape to Little Barn exceeded our expectations. The accommodation is characterful, spacious and well equipped and its location is both convenient and idyllic. The village store is around 100 yards away and there's a Waitrose within 4 miles. There are 4 Long Distance Walks that pass within a few hundred yards, which together with the railway station being less than a mile away, allowed us to enjoy a different walk every day of our stay without using our car. We are very much hoping to visit again in the future." "Well equipped property in a great location. Hosts very pleasant and helpful. Plenty to do in the area. Lovely walks from the door. Local wildlife interesting to observe." 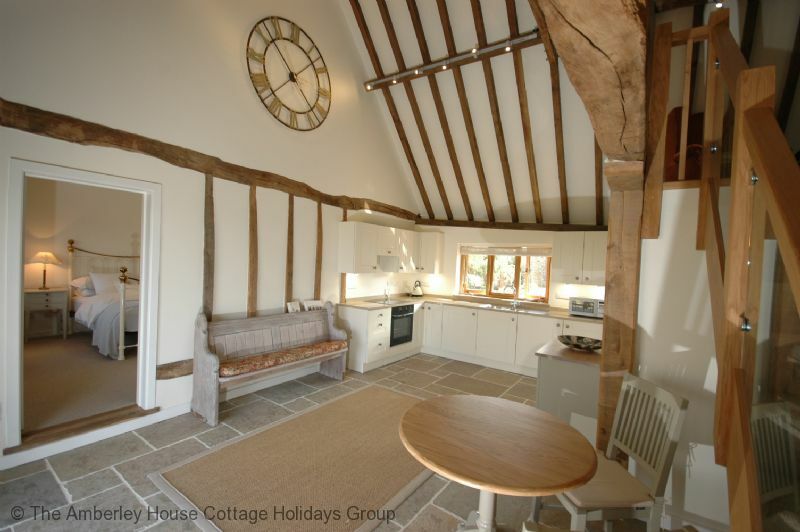 "Little barn is an excellent cottage in a wonderful location. 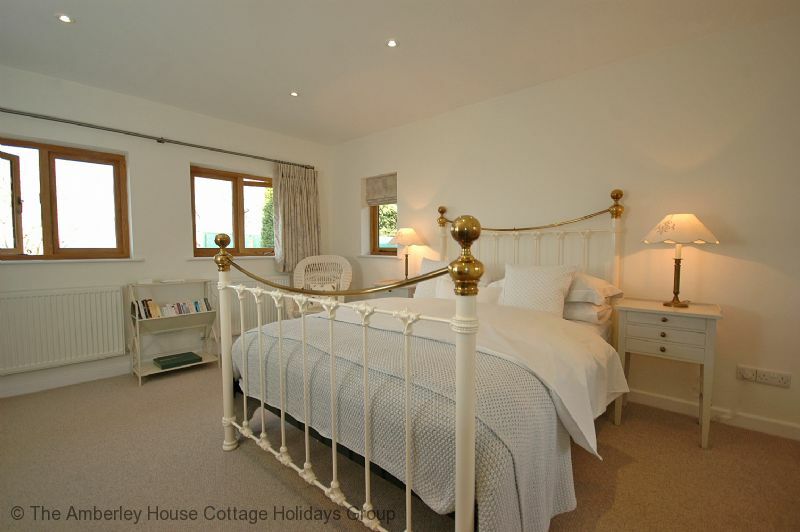 The cottage was spotless, comfortable and well equipped and the views are fabulous! The hosts are welcoming and friendly and gave lots of ideas for visiting the area. There are plenty of great walks from the cottage too. We had a very relaxing holiday and would love to return." 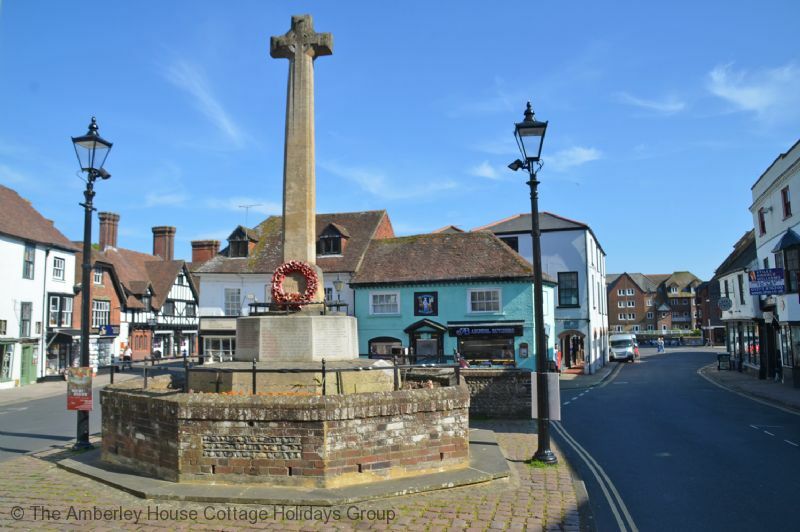 "beautiful spot- excellent for exploring West Sussex- particularly enjoyed Weald and Downland Museum, Parham House and worth the trip to Portsmouth for Mary Rose and the Victory"
"This was our first visit to the area and we were very impressed with all parts of our holiday. Little Barn proved to be exceptional in every way including the friendly owners and we look forward to returning. " 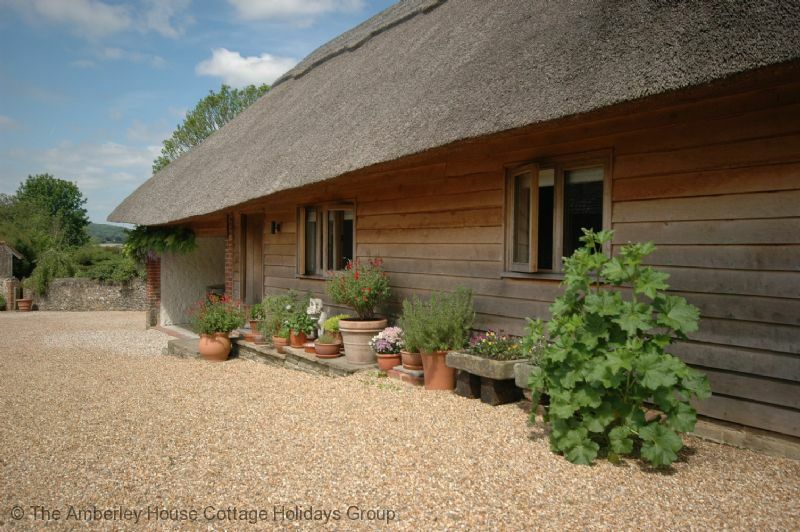 "Little Barn is an idyllic holiday cottage, ideally located, very comfortable, and with breathtaking views. The owners are attentive and helpful. I highly recommend it. " 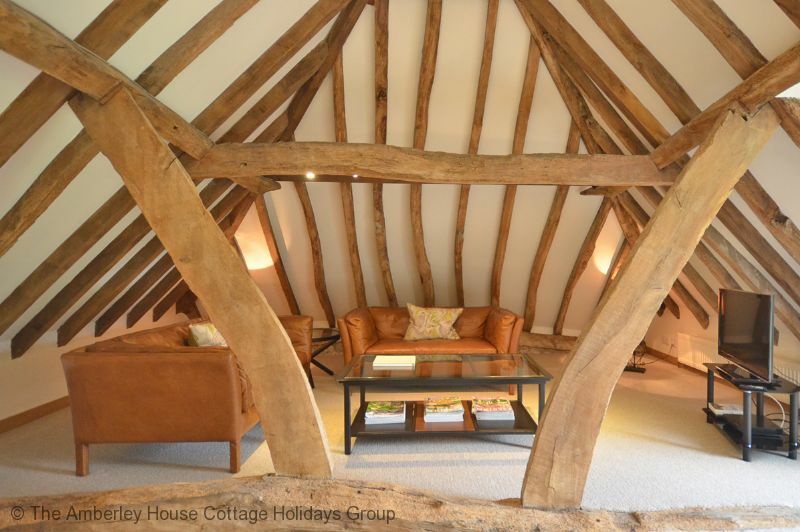 "My stay in the skillfully restored Barn was a bliss: the inside so cosy, comfortable and tasteful, the view and the terrace just wonderful, the surrounding gardens marvellous and the hosts so welcoming and charming. It is a very quiet place, perfect for relaxation but situated so well, that you have great places to see very near by. I have been more than happy there." "Beautiful property in a very beautiful location,even in the snow!! Definitely use again. Can also recommend the Bridge Inn." "This property is simply wonderful. 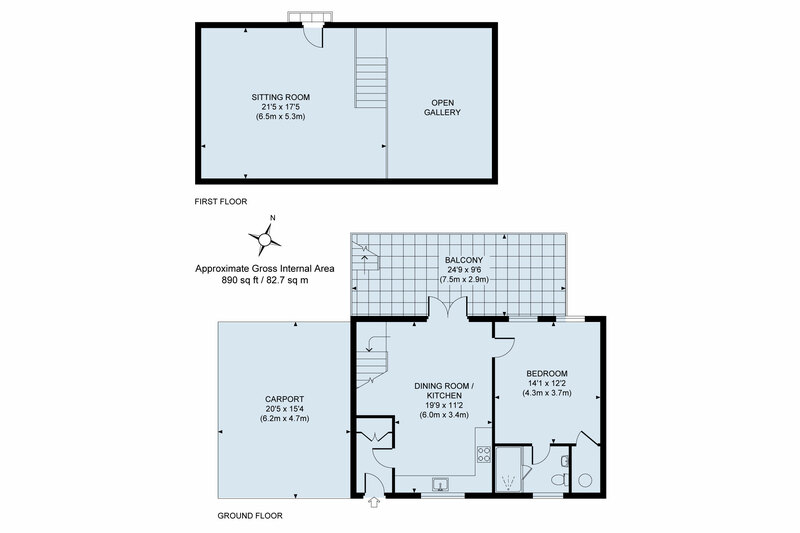 Extremely spacious and very well presented and of high quality. 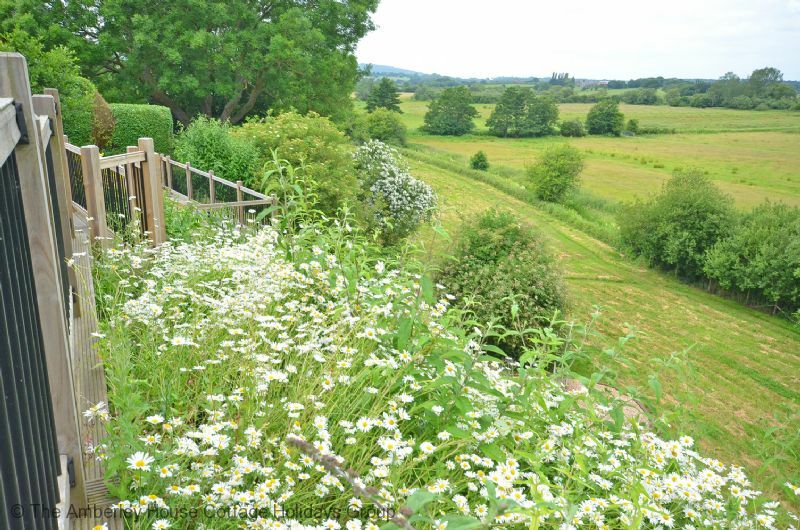 The garden immediately around Little Barn is beautiful and very well kept and the view from the elevated terrace over the water meadows is breathtaking. Carol and Peter are great hosts, very friendly and knowledgeable without being intrusive. 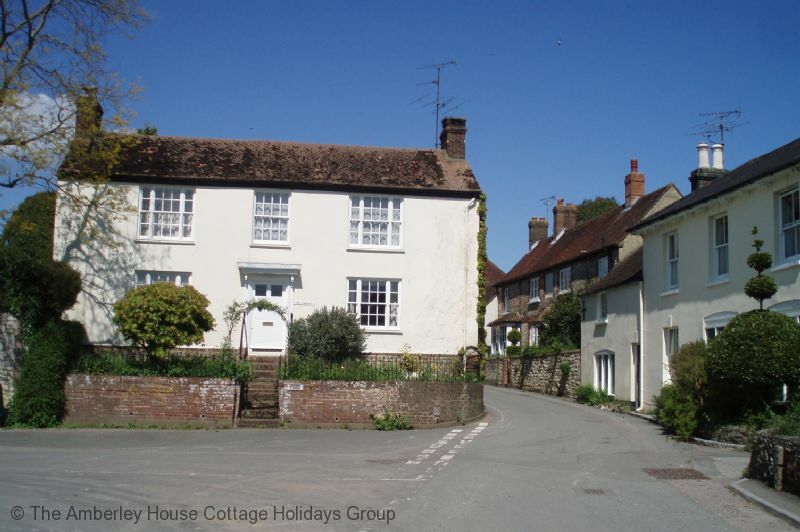 Loads to do in the surrounding area if you want an active holiday and a very comfortable cottage for relaxing in if you don't. Highly recommend Little Barn." 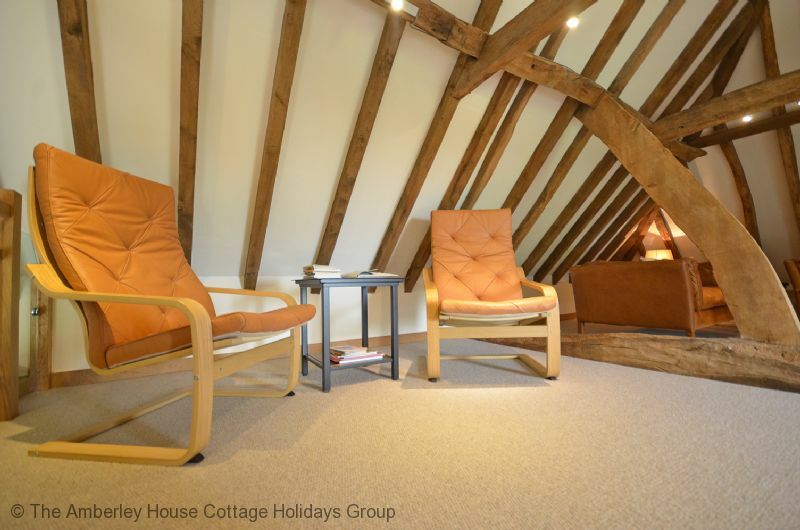 "We had a most enjoyable stay at Little Barn. The setting is unique and very beautiful and the accommodation is of the highest standard. The owners are most helpful and friendly and made you feel very welcome in their property. We would not hesitate to go there again. " "Just a lovely spot! 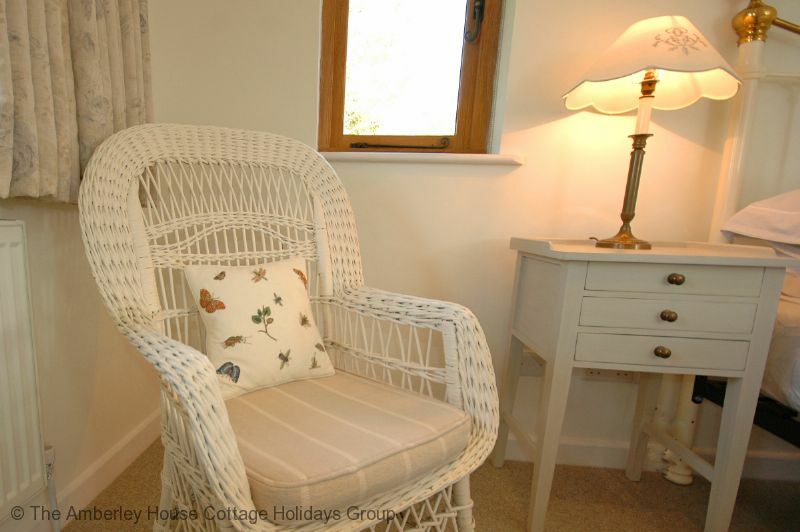 The cottage is very well appointed, lots of space and wonderful uniterupted views from the deck. Gracious, friendly and helpful hosts made it a home from home. " Highly recommended holiday cottage and hosts. 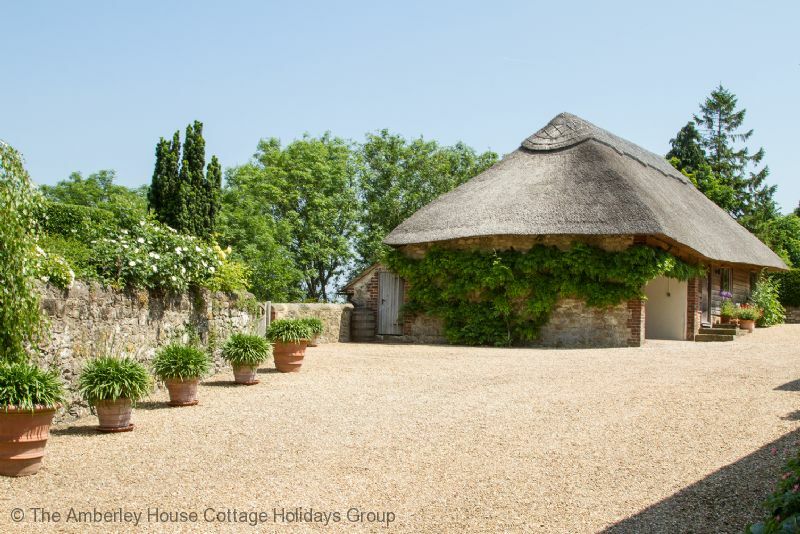 "A superbly renovated thatched barn in a beautiful village. The gardens around little barn are beautiful and we received a very warm welcome from our hosts, Carol and Peter. 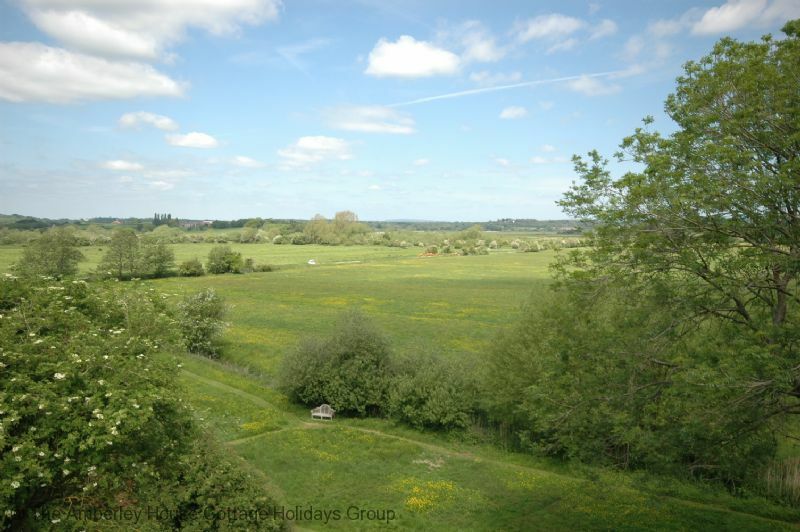 There are some lovely walks in the area and Little Barn provides an excellent central location to explore West Sussex." 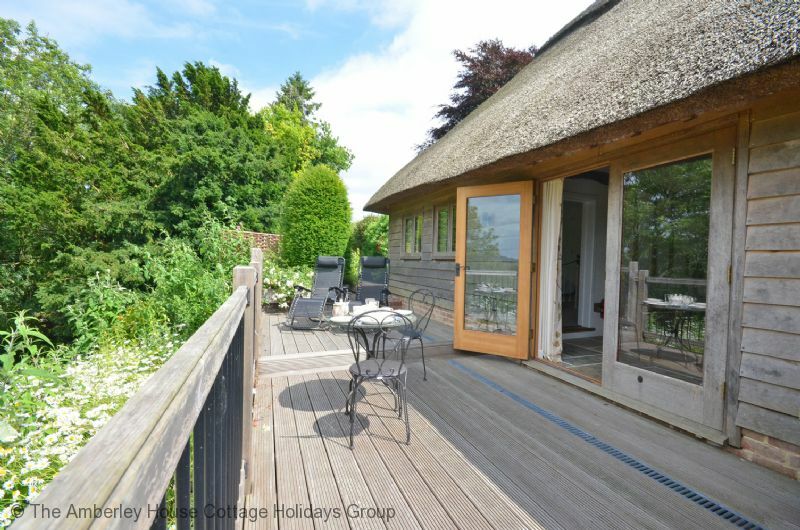 "A lovely cottage in grounds of owners property, private and very comfortable - the highlight is the deck for alfresco dining with absolutely superb views, local amenities on hand and walking out from property possible to South Downs and other walks, very near to Storrington and Arundel with Goodwood/Chichester/Worthing only a short drive - don't hesitate just stay there, you won't regret it!" 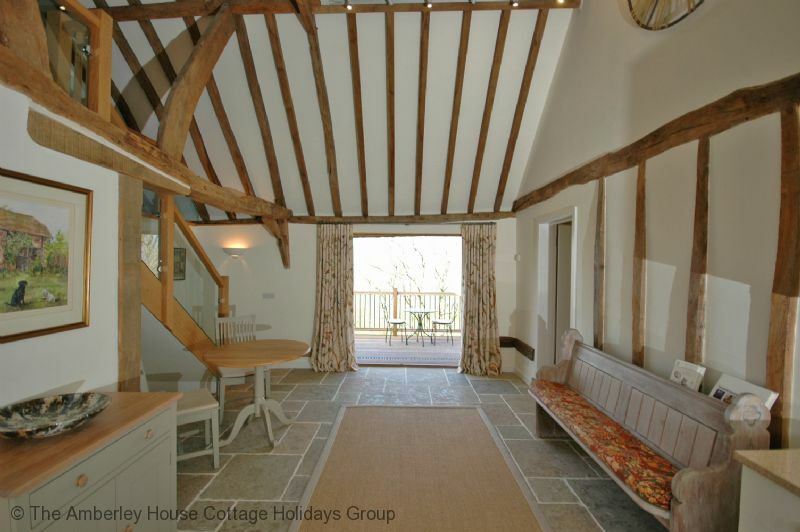 Superb barn conversion with every comfort in a lovely village. Wonderful views from private deck. "We had a lovely break in the Little Barn. The hosts gave us a very warm welcome and some good suggestions for restaurants and places to visit. 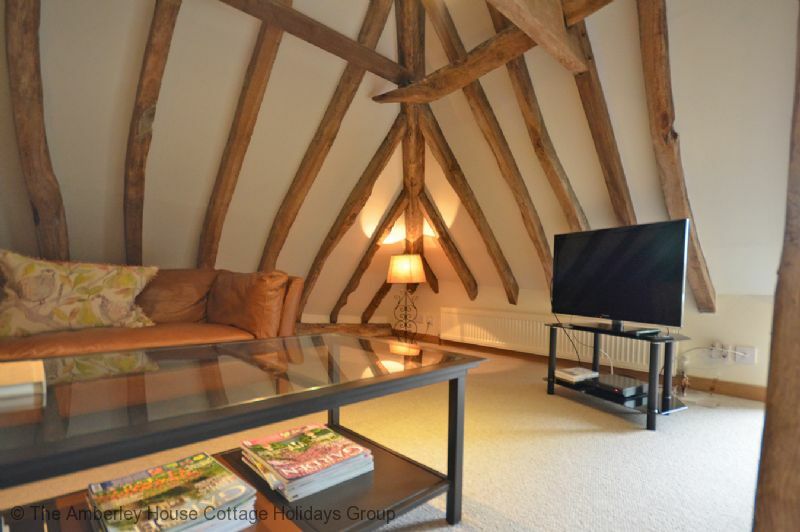 The barn has everything you need for a peaceful getaway for two in this lovely village and is a good base for exploring the area. Unfortunately we had mixed weather so we couldn't take advantage of the lovely balcony with wonderful views every day but we would definitely return." 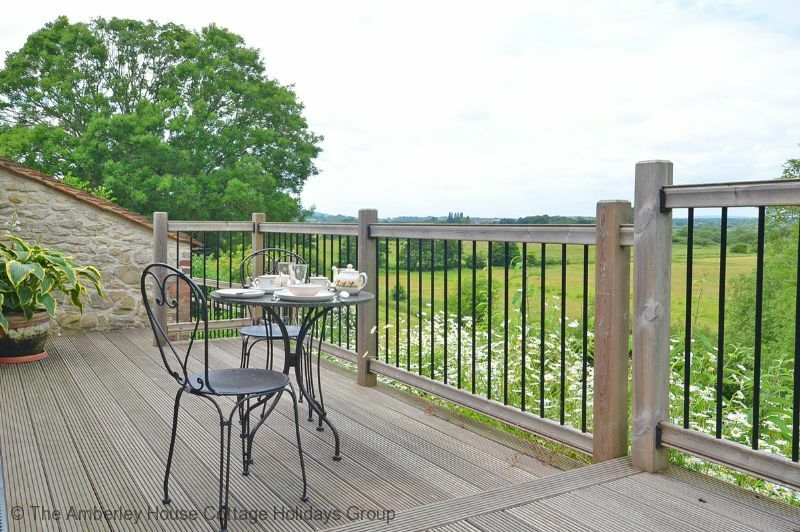 "The cottage is beautifully situated with extensive views over the water meadows. A quiet location but only 2 minutes walk from a well stocked village shop. The owners, who live in the old farmhouse on the large garden site, were welcoming and helpful but unobtrusive. 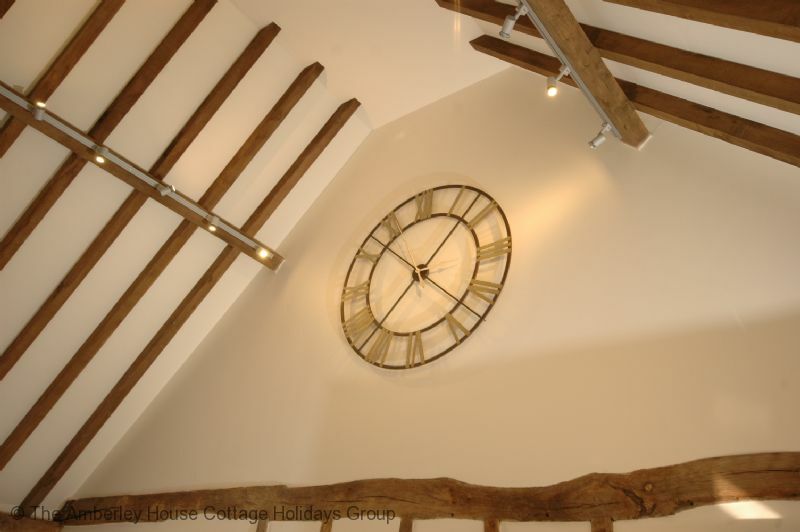 The old barn had been very sympathetically adapted and modernised and was furnished and equipped to a high standard. Very comfortable bed." 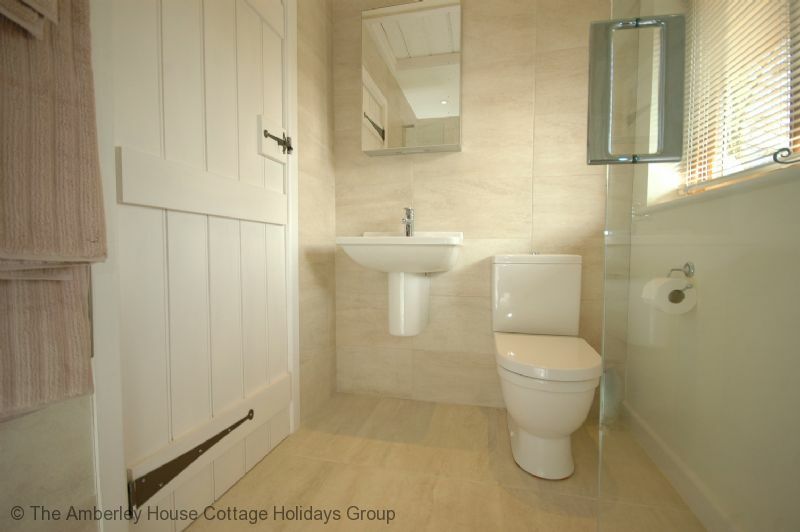 Top quality cottage in superb location. Extremely good for those interested in nature watching. 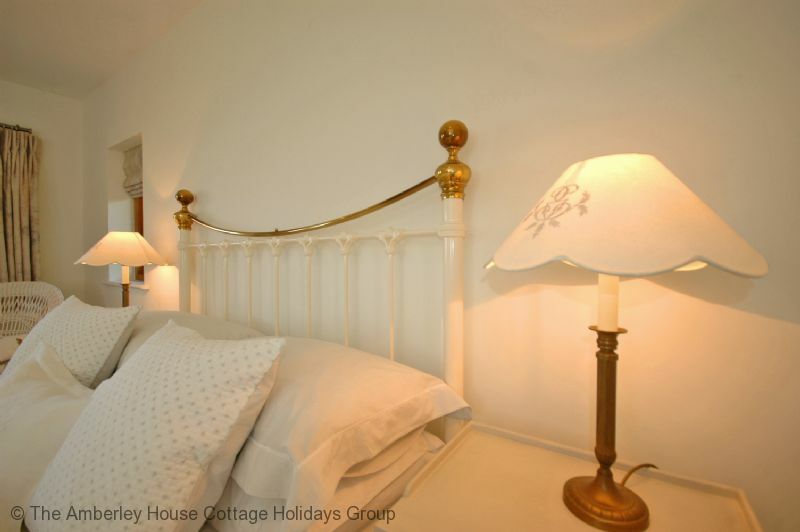 "An absolutely marvellous cottage with top quality fittings and lovely ambience. The layout with upstairs lounge works well. 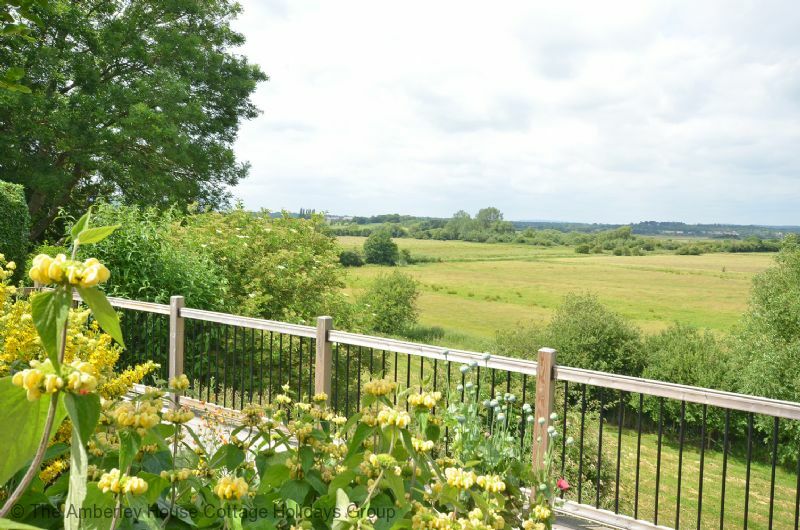 The outside veranda has a fantastic view over Amberley Wild Brooks. We could hear the Nightingales singing at midnight (in April). Very convenient for walks on the Downs. 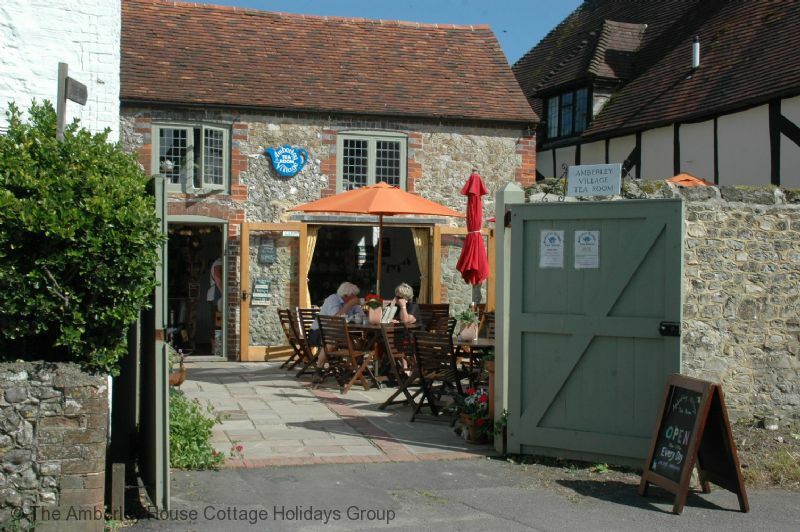 Two Good Food Guide eateries in nearby Arundel- the Parsons Table and the Town House. Owners close at hand to sort out any problems but we had none. We really enjoyed our four night stay. " "Never having visited the South Downs, my husband and I decided to spend a few days exploring. 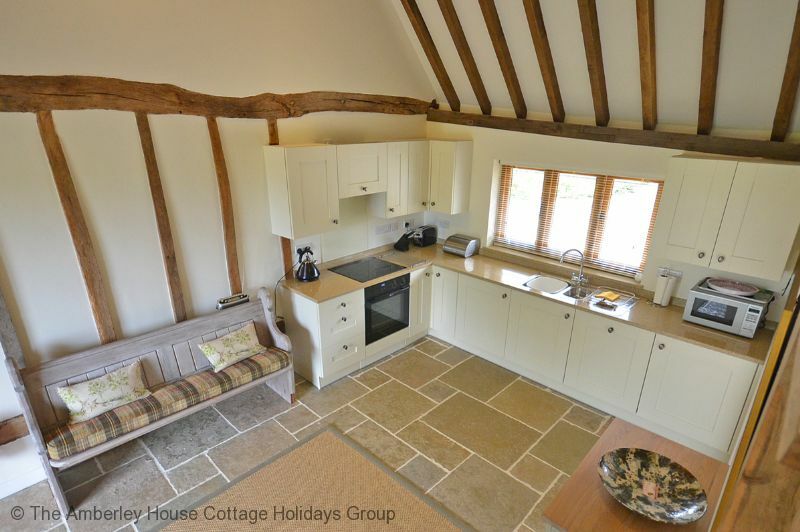 We spotted the Little Barn advertised by Amberley Cottages in RSPB magazine and booked it. It was an excellent choice. 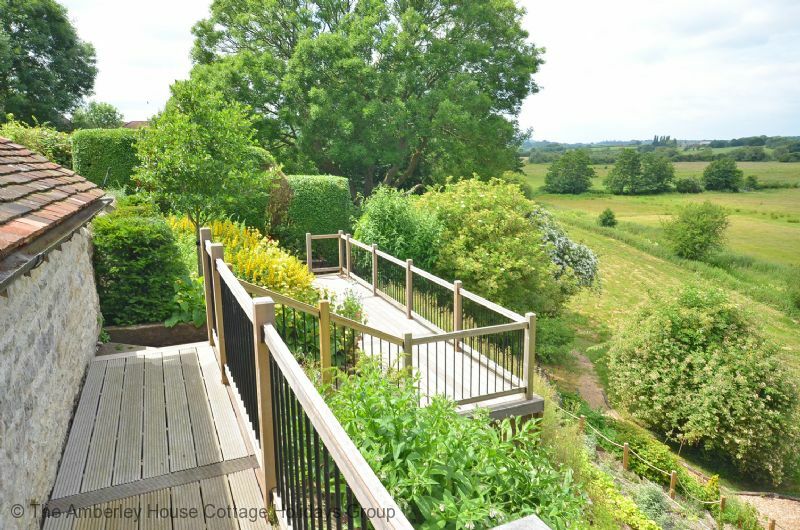 It is in a fantastic position in the lovely village of Amberley and overlooking the Amberley wild brooks. The accommodation was perfect, a home from home. The owners were friendly and welcoming. There were lots of places easy accessible by walking. A lovely relaxing and peaceful few days. We would definitely return."